Whatever: Comrades! Now Is The Time To Do Your Part For the Glorious Revolution! Comrades! Now Is The Time To Do Your Part For the Glorious Revolution! I swear that if I win, that last one is going to be my SFWA President business card. Yet another reason to vote for me. Also, I swear to you that these popped into my e-mail at pretty much exactly the right time. For a number of various reasons, of which this whole SFWA president thing is one, I've been unspeakably stressed all day long (evidence of this: I'm up at 2:38 am and am not tired at all). These showed up, and I got a smile as wide as the Volga, and suddenly I felt ever so much better. Theo Black, you are my hero. And so are you -- really, all of you who are sending along these posters and stuff. I don't want to make a big deal of it, but the fact is you folks doing this silly stuff is helping to keep my brain from jumping out of my skull and shoving itself into a kitchen appliance ("Will it Blend?" indeed). It's silly, it's stupid, it's dopey -- and right now it means the world to me. Thank you all kindly. Wow! Those are something! Man! Sweet work, Black! "Mr Scalzi: are you now, or have you ever been, a member of a Communist organization? No...? Then how do you explain these pictures?" I've seen enough of those "Will It Blend?" videos to guess that your brain would, indeed, blend. Possibly on a nice hot soup setting. These posters are awesome. Do you realize that you probably have more macros than Limecat now? 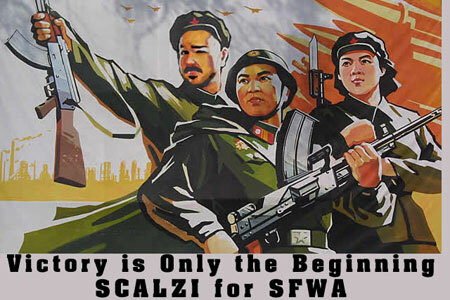 Now someone needs to do the Che Scalzi poster. Ah, if I only didn't have to work 12 hour days. 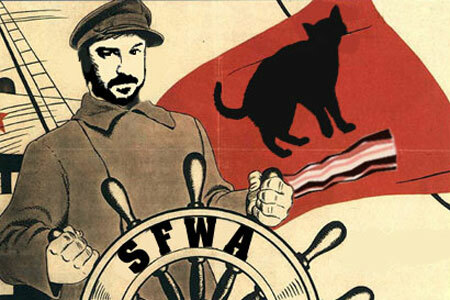 And then there could be the Uncle Sam/Scalzi, "I want YOU for SFWA." And the Scalzi the Rivetor, or INDUSTRY Poster. Can you please post a picture of your campaign headquarters? And where can I get these posters? I want to place them on telephone poles, Subways, all up and down Mariahilfestrasse! First SWFA THEN THE UNIVERSE! GO GO GO GO GO GO GOGOG DEWIT DEWIT GOGOGO! As for the new posters its funny that I am reading "The Communist Manifesto" by Karl Marx currently. Shara, that's a cat -- and a strip of bacon. Theo Black is made of awesome. All the posters are cool but Theo's are insanely awesome. I love the flag. John, you have a good platform. I hope you win but even if you don't, you've probably shaken things up a bit at a good time. Two out of three posters agree: you need a mustache to look more presidential. There might be a mustache in the first one as well, but I can't tell. I expect to be able to buy some of these as t-shirts in the near future! Here's my quick and dirty Che Scalzi. I did it while fixing fax machine. So when do we get to don the matching bacon and cat armbands to the flag of our beloved Scalzistan? We must join in solidarity behind our immortal and munificent leader. Let the world tremble before the mighty sound of thunder that will arise from our irresistible march into the future of humanity! Oh, brilliant! Brilliant! I am very impressed and amused. Wow. Those rock, Theo Black. You are nine kinds of awesome. I thought that's what the codeine-based cough syrup was for. Those rawk so hard that... that I regret starting this sentence! That last one is, indeed, the finest thing on the internet at this hour. That's obviously the official flag of the state of Catatonia. Maybe it's just the coedine talking, but that third poster looks like Keanu Reeves at the helm of the good ship бекон кошек. (Hope the Cyrillic comes through. John H - Boy, but that sounds unappetizing. This guy does some serious graphic work. Very nice. I lust. Seriously. After those gorgeous, gorgeous posters. These are the graphics from which truly great cult t-shirts are spawned. My vote is definitely for the third flag, though all are very nice :) Brilliantly done! Crickey. 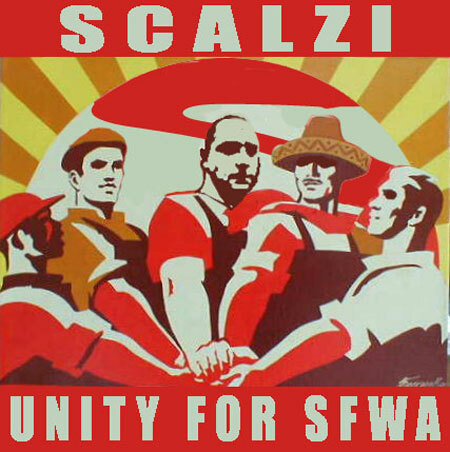 *I* want to run for president of SFWA now just so I can get a cool Black poster! You could fund SFWA by selling those as t-shirts in cons. Theo Black is not a True Believer! The bacon is not affixed to the cat in any way, thus demonstrating the lack of True Understanding.